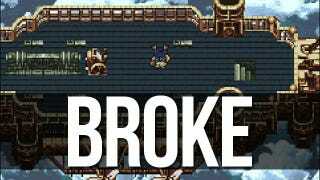 If you've played Final Fantasy VI, you've probably seen some weird glitches. Maybe you killed a boss by casting the spells Vanish and X-Zone. Maybe you realized that certain stats don't actually work as advertised. Or maybe you used Relm's Sketch ability on an invisible enemy and accidentally wiped out your Super Nintendo cartridge. Oops. But there's one exploit you've probably never discovered, a bug that lets you break Square's classic role-playing game in some unexpected ways. You can play as non-player characters, hack apart scripted events, and create all sorts of kooky chaos. And you don't even need a Game Genie. While thumbing through a random thread on the GameFAQs message boards early last year, graphic design student Dawn Hosie found someone talking about a strange glitch that could potentially break Final Fantasy VI, one of her favorite games. Naturally, she wanted to re-create it. Hosie, who moonlights as a freelance advertiser, says she does this sort of thing fairly often. "Most nerds churn out their relaxing hours into MMOs or Call of Duty," Hosie told me via e-mail. "I'd rather put it into picking apart old-era video games. It's a weird hobby, but I adore it." So she re-created the bug and poked away at the game, trying to see what sort of hilarious havok she could wreak. She turned the results into a massive thread over at the Something Awful forums, which you can read in its entirety here. First up, play through the game's intro until you're leaving the city of Narshe with Terra and Locke. Play allllll the way through Final Fantasy VI until you get to the Floating Continent. Lift off as normal. When you get to this section of the Floating Continent, jump back on your airship. Fly around for a while. Hosie recommends you do this for at least 30 seconds. Lift back off and head to the Floating Continent again. Now you can break the game. I'm not a coder myself, so maybe this isn't entirely accurate and someone can correct me (or figure it out), but we believe that there is a bug with how the game handles your airship state. I'm going to explain this in layman's terms as best I can. When you board the Floating Continent, because you go directly from the airship to the Floating Continent, you never actually leave the airship. When you die, the on-airship flag is removed, like when you die in most airship encounters. However, by jumping back onto the airship from the Floating Continent and flying around, you activate another flag that says you're on the airship, effectively giving the "do you have an airship?" a value of 2. Therefore, when you die, that value gets decreased by one, giving you the "do you have an airship?" a value of 1. That way when you come back wherever you last saved, you keep your airship and can then explore the world. This is all speculation of course. Nobody that I'm aware of has figured it out. I'm not sure why this only happens on the Floating Continent, either. Maybe it's because the game developers wanted to do a map change while technically being on the airship, because normally at the end of the Floating Continent sequence you reappear on the airship and it would save on game memory? I'd really love to find out exactly why and how. It's one of those enjoyable mysteries. Quick note: When you land the airship after taking off, it will disappear. And if you enter the interior while flying, you won't be able to leave. So this is a one-shot glitch. You can head to Zozo with Locke and Terra and activate a trigger that substitutes the people who are supposed to be in your party—who you haven't met yet—with Moogles. You can break the Narshe defending sequence and transform all of your character sprites into weird versions of Terra with Celes's color palette. You can get to the World of Ruin before activating certain sequences, like the escape from Edgar's castle. You can then go back and activate that sequence, which somehow transports you back to the World of Balance. He won't get off the raft. You can take your raft on the airship. And to other various locations. You can keep Banon in your party, bring him to the Opera House and make his sprite explode. You can keep Terra in your party for the Maduin event, then watch her make love to her own mother. And you can play as General Leo. Or at his own grave. "When you board the airship to go back to the Floating Continent and continue the game, you're forced to the character select screen which forces General Leo out of your party," Hosie said. "It's really unfortunate. I'd love to be able to take him into the World of Ruin. All you can do is fly around the World of Balance. Still, it's General Leo. He lives!" To see all of Hosie's work, including a few more strange bugs, you should check out the whole thread. It's a really entertaining read. And Hosie thinks there are still things we might not have discovered yet. "While we've dived pretty deep into the glitches and uncovered a lot, there's always more to discover," Hosie said. "Glitches are an odd thing—20 years down the line people (including myself) are finding things out that we had no idea were possible. I look forward to the next crazy exploit someone figures out in FFVI and how it'll burst the game open at its seams. Maybe it'll be myself, maybe it'll be someone else. Either way, as long as it's entertaining, I'm happy."